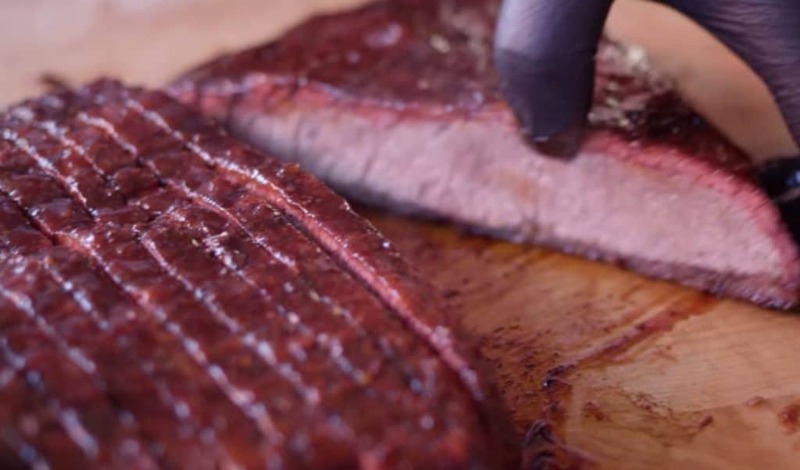 I wanted to share this trio of instructional brisket videos from Chef Tom of All Things BBQ. You are going to see three different briskets cooked three different ways on three different smokers. I am sharing this videos to drive home the point that there are MANY different ways of making an incredible smoked brisket and to encourage you not to get hung up on one particular style. Smoked brisket is one of the most controversial and feared topics in the barbecue world. One of the core issues is whether brisket should be cooked Texas Style or KCBS Competition Style. Chef Tom’s videos show you how to tackle both techniques. Even better, he has made a third brisket video that demonstrates that you can completely ignore both Texas and Competition style and sill have incredible brisket. The trimming is simple and mainly involves taking out the large, hard fat deposits. Tom wanted a little more flavor than you get with salt and pepper so he uses a fancier brisket rub. The brisket is not injected. The brisket is smoked on a stick burner around 225-250 and gets wrapped in butcher’s paper after about 6 hours. The entire cook plus resting takes about 13 hours total. The brisket gets cooked to an internal temperature of about 210F. The high temperature makes for a pretty tender brisket which is sliced thicker than competition style. This is the absolute best video on competition style brisket I have ever seen. The brisket is extensively trimmed. The point and flat are separated prior to cooking and the end of the point is butterflied to create a consistent thick piece of meat. This method really opened my eyes on trimming briskets and now forms the base of how I tackle these guys on my kettle. Chef Tom layers two brisket rubs and injects with a competition tested blend of seasonings. The brisket is cooked on a pellet smoker and wrapped in foil after a few hours to protect the color of the brisket. The brisket is sauced and burnt ends are prepared from the point. Tom shows you how to pick the best slices for turn in by using the bend test. I simply love this last video. People get so freaked out over Texas Style vs KCBS Competition Style that they actually scare off a lot of beginners from ever trying to smoke a brisket. Guess what? Great brisket can be EASY! In this third video Chef Tom takes a three pound section of a brisket containing both flat and point and cooks it on a ceramic cooker until it is fall apart tender. Add some sauce, a toasted bun and a few condiments and you can have one of the best barbecue sandwiches you have ever put in your mouth. I hoped you enjoyed Chef Tom’s three takes on smoked brisket. I hope one of the big takeaways for you is that there is no “perfect” way to cook a brisket. There are at least 20 ways of tackling smoked brisket. The best way is the one that YOU enjoy the most. It’s that simple. Take a moment and subscribe to the All Things BBQ YouTube channel. They put out great content that you don’t want to miss. WOW! Looks amazing, Q #1 is there a big difference in cooking a Texas Style brisket with a pellet smoker? Q 2 what if just cooking a point or a flat, as that is what I see at local grocery store (usually the flat) Q3 Is one (flat or point) better then the other ? 1. Biggest difference with using a pellet smoker is that it is much easier to control the temperature. Everything else is the same. 2. If you are just cooking a point or flat the cook time will be shorter by a few hours. 3. Point vs Flat: The point is much better for eating. The flat is prettier and makes nice slices.